THE slump which inevitably followed the shipping boom in the war of 1914-18 caused many revolutionary changes in naval architecture and marine engineering. Many ingenious inventions appeared; but many were either given no chance at all, or else, after a promising start, lost favour and disappeared. The ship which could carry cargo with the greatest economy was the one which got business. Germany, particularly hard hit by the surrender of her Merchant Service, had the greatest need for economical ships and probably possessed the most ingenious inventors to supply them. Time and again in the history of shipping the disast-rous effects of a slump had been overcome only by drastic technical improvement, such as the replacement of the paddle by the screw, the introduction of the surface condenser, the compound engine, the tripleexpansion engine, and other economizers. In addition the experience of the war had taught men to adapt both material and knowledge to purposes vastly different from those for which they had originally been intended. So the years which immediately followed the war were particularly favourable for revolutionary changes in shipping material, and there was still plenty of capital available for experiment. Perhaps the most interesting experiment was the rotor ship. In this an attempt was made to revive the prospects of sail, the oldest method of ship propulsion, by the latest theory of aero-dynamics. The rotor ship was introduced to the public in 1924 and immediately captured the popular imagination, perhaps because the tall rotor towers were something visible, as were the paddle-wheels which have always found their enthusiastic admirers. The inventor was Herr Anton Flettner, a young German who had already made a big reputation for himself among engineers and scientists in his own country. (The times were not propitious for reputations to cross borders.) As a boy of seventeen he had made a voyage to Australia in a sailing ship and had become interested in sail. As a young engineer in the Zeppelin Works he had made a close practical study of aero-dynamics. Although his earliest invention was of a quite different nature - a form of wireless distant control for handling tanks in war-time - he really made his name by the Flettner ship rudder which utilized aero-dynamic knowledge and adapted it to sea water. Going to Holland to superintend the making and fitting of his rudder, he resumed his interest in sailing vessels. He set his mind to find an improvement on the propulsive power of the little auxiliary coasters that were becoming so numerous and popular. ROTOR TOWERS. 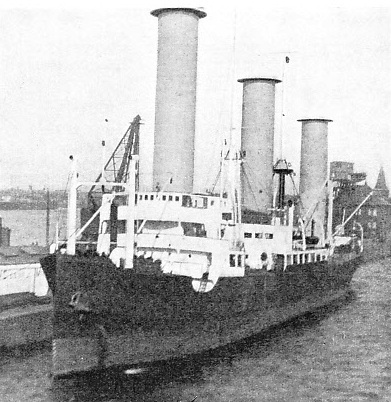 Herr Anton Flettner’s idea was to use rotor towers as a substitute for sails in coasting vessels. His object was to take better advantage of the wind as an auxiliary to a ship’s engines, and thus obtain higher speeds with the same horse-power. Illustrated is the Barbara, the first rotor ship to be built as such. Ordered by the German naval authorities, she was constructed at Bremen. She was a single-screw ship of 2,077 gross tons, and was propelled by two six-cylinder diesel engines. Flettner began with metal sails, much smaller and handier than the ordinary canvas ones, and carefully balanced and shaped to conform with his experience with rudders and the air. In attempting to work out this problem he studied deeply, drawing not only from his own experience, but also from those of his predecessors. The Magnus principle of the effect of wind on violently rotating bodies was one of those which received his attention. This principle had originally been worked out in connexion with artillery, but it had recently been more closely studied in association with the force of wind on aeroplane wings which tends to lift at right angles to its direction. After much difficulty Flettner secured the necessary backing. In 1924 he converted to his ideas the little schooner Buckau, a vessel of 455 tons gross which had been built in 1920. Her small hull appeared to be hopelessly overbalanced by the two towers, 9 feet in diameter, with a height of 50 feet above the deck. These were rotated at a speed of 140 revolutions a minute by a small motor of 45 horse-power; the screw was driven by an ordinary motor engine of 200 horse-power. It will be noticed - and the point is of the greatest importance - that no attempt was made to drive the ship by rotor power alone. That was never Herr Flettner’s idea, and the totally unwarranted assumption that he had invented a new prime mover was the cause of most of his subsequent troubles and disappointments. He himself suggested nothing of the sort. The rotor towers were a substitute for sail. Their object was to take advantage of the wind as an auxiliary to the engines and to permit greater speed with the same horse-power and economy. Flettner’s only claim was that the rotor towers were more efficient than the ordinary canvas sail. He maintained that they got more out of the wind and were able to take full advantage of it no matter what its direction might be. Had this been fully appreciated from the first it is not at all improbable that rotor vessels would be built to-day. Making full use of the Magnus principle, the towers of thin steel, quite light in spite of their bulky appearance, and no danger to the ship’s stability, were rotated, clockwise or anti-clockwise, according to the wind; they got the last ounce of help out of it, both pushing and pulling. But without the wind they would not propel a ship at all, and without the help of a screw propeller they were intended only for use in yachts and pleasure craft. THE ROTOR TOWERS of the Barbara were of an aluminium alloy. Each rotor was 55 feet high with a diameter of about 13 feet. The air surface of the rotor was 2,196 square feet. On her trials the Barbara made 6 knots in a fair wind with rotors only, 9 knots with motors only, and 10½ knots with both. Later the rotors were made to give the engines more assistance, bringing the ship’s speed up to 13 knots. 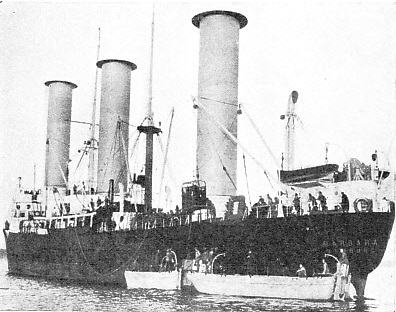 Unfortunately, when the little Buckau, with her ungainly towers, carried out trials in German waters and then crossed the North Sea in winter with a full cargo of timber, she immediately attracted popular attention and was hailed as being nearly as great a revolution in ship design as the first steamer. She was a pioneer and she was also a makeshift conversion, so that much had to be forgiven her. Yet she had shown remarkably good results. She was absolutely reliable and seaworthy, but there was little possibility of studying costs. Later she was renamed Baden-Baden and sent across to America, where she attracted great attention after a perfectly satisfactory passage across the Atlantic. In the meantime the German Admiralty had become keenly interested in the principle, not with the idea of fixing huge rotor towers on the decks of battleships, which would, of course, have been absurd, but because of the wider scientific principles involved. It was the naval authorities who gave orders for the construction of the Barbara, the first rotor ship to be designed as such from the beginning, although she was run on the fruit service of the Sloman Line. She was built by the Weser Yard of Bremen, which had already turned out a number of normal cargo motor ships to the same dimensions and hull design. She was a single-screw ship of 2,077 tons gross, driven by two six-cylinder four-cycle diesel engines coupled to a single shaft. She had a horse-power of 1,060 for a designed speed of ten knots. The Barbara was fitted with three rotor towers instead of two, as in the Buckau. The rotor towers were made of “Lauta” metal, an aluminium alloy with the strength of steel. Each rotor was 55 feet high with a diameter of about 13 feet, the rotating part weighing about one and a half tons. The total air surface of these rotors was 2,196 sq. ft., and they were driven by geared electric motors at a speed which was easily controlled from the bridge, the maximum being 160 revolutions a minute. The success of the rotor ship depends on the towers revolving at a speed which bears a definite relationship to the wind velocity. On the first trials of the Barbara, before her designers had had any experience, she made 6 knots with the rotors only, in a fair wind, 9 knots with the motors only, and 10½ knots with motors and rotors together. After a little experience with their adjustment she could easily contrive 13 knots with both running. This was reckoned to be an extra three knots due to the rotors, with an engine of 60 horse-power doing the work of one of 530 horse-power had it been geared to the shaft. The Barbara was put on the Mediterranean fruit trade. On her maiden voyage she had almost constant calms, and it was impossible to use the rotors; but homeward she got a reasonable wind and, with the towers running, she was able to maintain her full schedule speed and reduce the main engines to half power. On this voyage she encountered another German motor ship of greater propelling power. When there was any breeze the Barbara passed her easily enough, but as soon as the breeze fell she dropped astern. The result of her first five voyages was published. It was reported that the rotors had been used with full advantage for about twenty-five per cent of the time at sea, and that when the wind had been favourable they had increased the speed by two and a half or three knots. This increase had been obtained with approximately ten per cent of the power that would have been necessary to do the same by ordinary means. The Barbara’s seaworthiness and manoeuvring qualities were unimpaired, but it had to be pointed out that the capital costs were considerable. These were felt all through the life of the ship in the shape of overhead charges. The Baden-Baden (ex Buckau) created great interest in the United States, and the German Navy reported on the Barbara that the rotor had a big future. But it had the disadvantage of high initial cost, and the post-war slump took a turn for the worse just at the time when the principle was fighting for recognition. So it was abandoned. The Baden-Baden was converted back to an ordinary schooner and the Barbara eventually had her towers removed. It is impossible to say how much of this disappointing result was due to ill-advised enthusiasm in the first place. The principle had so much to recommend it that it was championed by many unskilled advocates, who were attracted by its superficial advantages but ignorant of the limitations of the principles involved. It is unfortunate that the wide publicity obtained by the invention led the public to expect things which the inventor knew to be impossible. Some day, perhaps, the rotor may come into its own again.